Quick Fixes to iOS 12 Problems/Bugs! iOS 12 brings us a lot of bold changes. iOS 12 is a big deal of the highly anticipated WWDC 2018. With a slew of exciting features available like the rasied performance speed, group facetime, unique USDZ AR file format, Measure App, improved Siri, ARKit 2.0 etc, many users are excited to update to iOS 12 to delve into its headlining changes. But you may probably come across the questions: should I update iPhone to iOS 12? What are the specific iOS 12 features & benefits over the current iOS 11.4.1? How to download and upgrade to iOS 12 without any bugs? Just catch up on our full coverage iOS 12 features on iPhone XR, iPhone XS/Max, as well as iOS 12 update guide. Meanwhile, we'll dig through the iPhone X/8/7/6S/6/SE/5s backup tips, latest iOS 12 update problems and fixes. After much anticipation, iOS 12 comes at a time in WWDC 2018. The latest iOS ecosystem advances thoroughly, including a smarter Siri, unique screen time and limiting distractions, memoji and animoji, enhanced privacy, security and safety, faster and more responsive performance and many more exciting features. All of those new features set good reasons to update to iOS 12 on iPhone iPad. To allow you dig deeper, here we've covered the significant iOS 12 features in our complete iOS 12 update guide below. iOS 12 has been enhanced for a faster and more responsive experience, namely 70% faster swipe to Camera, 50% faster keyboard display and 2X faster app launch under heavy workload. FaceTime supports video and audio with up to 32 people maximumly after iOS 12 upgrading. Even you can use Memoji in your group FcaeTime on iPhone, iPad, Mac and Apple Watch. iOS 12 allows you to set Do Not Disturb just for a meeting or somewhere, and it will automatically turn off as soon as your event ends. Thus you'll not be bothered with endless notifications. ARKit 2 will bring better 3D graphics rendering capability, as well as the ability to recognize real objects. Meanwhile, it even supports a Shared AR experience for gaming or academic discussion. Brand-new Measure App in iOS 12 will help you make a measurement through ARKit 2. It can be applied to measure the length, width and height of any objects. In iOS 12, searching is more powerful in Photos app, allowing you to search by name, time, categories, etc. A new "For You" tab has been added to the Photos, too. With a new Siri Shortcuts feature, you can create multi-step shortcuts using third-party apps that can then be activated using a Siri voice command. It's deeply customizable. Screen Time is a new section built into the Settings app of the iOS 12, which collects data on what you're doing on iPhone iPad devices for a better time managemnet. 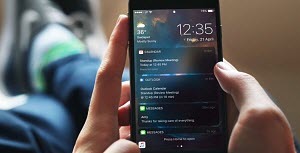 iOS 12 offers more options and operations for notification on lock screen. It can be categorized by app or keywords. Mark as read and delete in batch are available as well. iOS 12 is more focused on performance and quality improvements, including enhanced Augmented Reality features, improved parental controls, FaceTime enhancements, Mail and other app upgrade, new home screen, etc. Apparently, iOS 12 may be the most stable and powerful iOS ever. Those who don't want to update to iOS 11 may wait for iOS 12. If you haven't updated to the new iOS 12 beta 7 on your iOS device as of yet, you may notice that the over-the-air update option is no longer available, and that's because Apple has pulled the download. 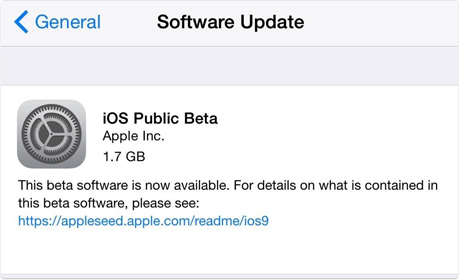 Apple appears to have removed the beta 7 update because of performance issues. iOS 12 beta 6 changes and features covered 3 new stock gradient wallpapers, wallpaper rearranged, and iOS 10 wallpaper removed, updated AirPlay icon in Music Widget, new Photo Library icon in Messages camera, new splash screen on Books, rounded picture-in-picture on iPad. FaceTime group chats were originally scheduled for the iOS 12 release, while the developer Guilherme Rambo has revealed the feature has been removed in the latest iOS 12 beta 7 release today. Apple says the feature "will ship in a future software update later this fall." In addition to the above new iOS 12 features, the next-gen operating system has offered many more benefits that users can't enjoy on the previous iOS 11. However, the problem of whether or not to upgrade comes up every year, and it's no difference with iOS 11 to iOS 12 update. In fact, there are plenty of attractive features to consider iOS 12 download and install, but also some that may stop you from jumping the gun. If you don't want to uninstall iOS 12 to reinstall iOS 11, check the iOS 12 vs iOS 11 advantages and disadvantages below. - In-camera augmented reality (AR) support. 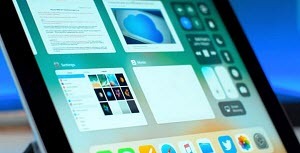 - More iPad specific features to make iPad more productive. - More new features like redesigned Control Center, iMessage, etc. - iOS 11 screen recording feature eliminates 3rd party recording apps. - 32-bit not supported in iOS 11 and iOS 11 problems in early stage. - More features like Siri Shortcuts, Animoji, FaceTime, Photos etc. - Digital wellbeing with Do Not Disturb, Notifications, Screen Time etc. - Incompatible with devices earlier than iPhone 5S , iPad mini 2. Get stuck on iOS 12? Downgrade iOS 12 to iOS 11. ● iOS 12 Problems in Performance? Simple to Fix! Face with iOS 12 problems? Here is the troubleshooting. There are many users who don't want to upgrade to iOS 12 as it's not a pipe course. Many run into various iOS 12 update problems due to improper process, for example, device incompatibility, no enough space for iOS 12 upgrade, iDevice goes out of power during iOS 12 updating, data is missing after iOS 12 update provided you didn't backup iPhone X/8/7/6S/SE/6/Plus/5s or iPad. 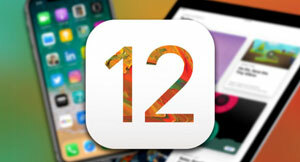 Before you move and upgrade to iOS 12 from iOS 12 beta or iOS 11.4.1, prepare for an efficient iOS 12 software update on iPhone iPad to avoid any iOS 12 problems. To avoid any unnecessary iOS 12 updating problems, first check if your device makes the cut for an iOS 12 download & update. Compared to iOS 11, iOS 12 drops support for iPhone 5 and iPad mini. Check the full list of iPhone, iPad, or iPod touch that is compatible with iOS 12 below. Every iOS update sees user reporting data loss. 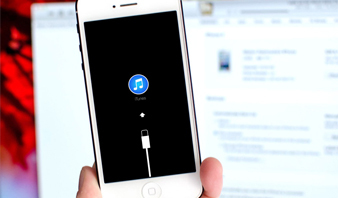 If you don't want to be one of those searching for recovery software to get back important data, like your cherished photos, music, videos and others stored on iPhone or iPad, it's wise to backup iPhone, iPad or iPod before iOS 12 update. How to backup iPhone 6/6 Plus/6S/SE/7/Plus/8/X, iPad Pro or iPod Touch 6? Check the following section. Don't have enough space for iOS 12 download on iPhone iPad? Fear of data loss problem after iOS 12 upgrade? Tire of tedious iTunes sync or data erasing? You worry will end up here. MacX MediaTrans is the best iPhone iPad iPod manager that can easily manage, transfer, backup iPhone iPad data, including videos, music, photos, books, iTunes purchases, ringtones etc, fast in one click. Get full prepared to upgrade iPhone iPad from iOS 11 to iOS 12. Step 1. Connect your iPhone iPad to computer with USB cable. Step 2. 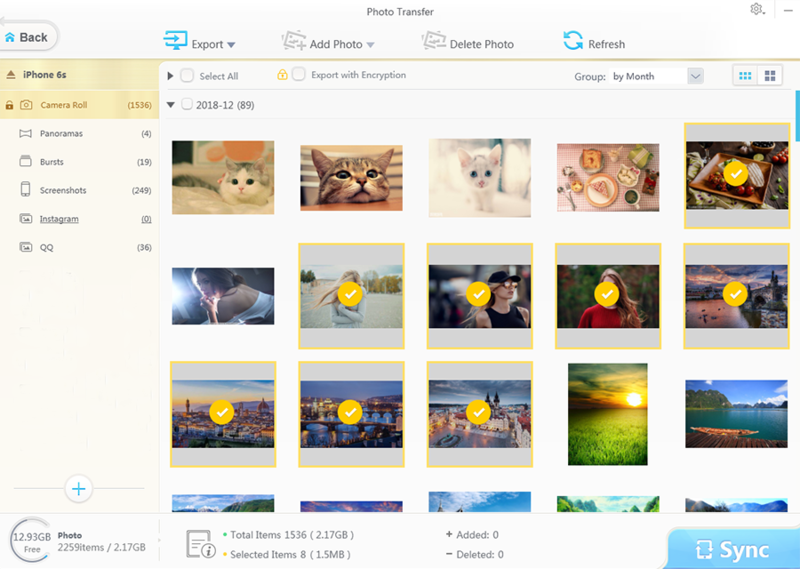 Click "Photo Transfer" to tick out the iOS photo backup. Step 3. Choose photos grouped by day, month or year. Step 4. Click "Export" button to sync iDevice photos to computer. Step 1. Connect your iPhone iPod to computer with USB cable. Step 2. 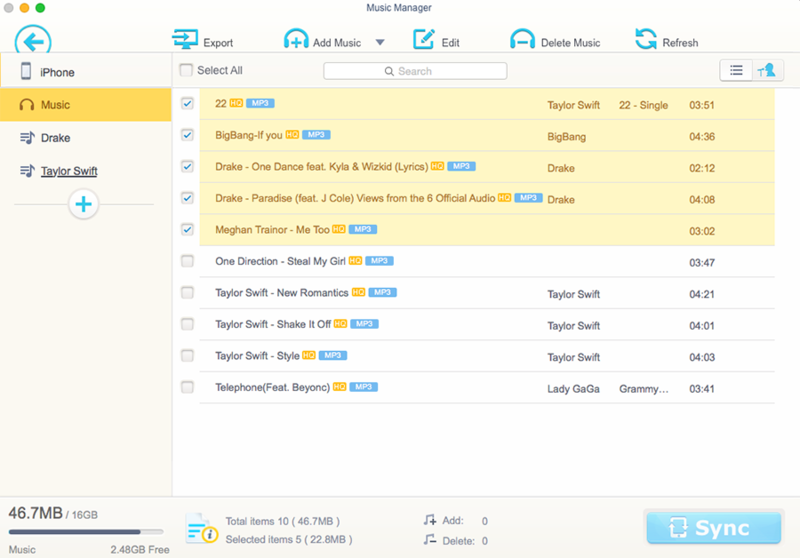 Click "Music Manager" to step into music transfer process. Step 3.Choose songs/playlists, iTunes purchased music to backup. Step 4.Click "Sync"button to start copying iPhone iPod music. Step 2. Click "Video" to enter into video transfer interface. Step 3. Select the videos, like 4K UHD, movies, to be transferred. Step 4. Click "Export" button to transfer videos to computer. Step 2. Click "Flash Drive" button on the main interface. Step 3. Tap on "Add File" button. Step 4. Add files, folder, everything on computer. iOS 12 takes up less of allocated storage space than iOS 11, which increases the amount of available storage on iPhone iPad. However, the nearly 4GB is still quite a lot for smaller iPhone in 16GB,32GB or 64GB range. To free download and update to iOS 12 with no trouble, you'd better free up iPhone iPad space for iOS 12 update. Rather than squeezing a few important photos or videos from your device, we recommend moving media files to computer to have a safe backup of the cherished memories while freeing up enough space for iOS 12 upgrade. 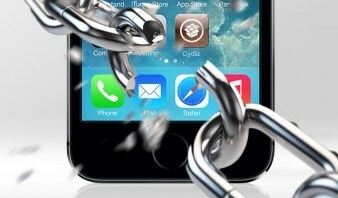 Click to see detailed steps to free up iPhone iPad space >> . To see how much storage is remaining on your iOS device, go to Settings -> General -> Usage. As with every iOS update, there are users complaining errors like "Unable to Install Update", iOS 12 download stuck or the like. In fact, some iOS 12 update problems also involve iTunes version. Specifically, iPhone or iPad no longer works with Macs if iTunes stays in the older version. In order to make iTunes compatible with the new features of iOS 12 and macOS 10.14, update iTunes to the latest version (iTunes 12.8), so as to avoid any update to iOS 12 problems with iTunes errors. Note: iTunes sync is blamed for data erasing if improper process is done, so be careful or choose an iTunes alternative to manage your iPhone iPad safely and backup iPhone without iTunes. Apps running well on elder iOS 10.3.3 or earlier doesn't mean that they will work smoothly on iOS 12. In fact, if you upgrade to iOS 12 from iOS 10 or eariler, all support for 32-bit apps will be removed. You can go to "General" Settings > "About" > "Applications" to check for 32-bit apps and upgrade them to the latest version if there are 64-bit version available. This will also help to fix app crashing or freezing problems in iOS 12 upgrade from iOS 10 or earlier. Note: Too many running apps may slow down your iPhone iPad or take up your iDevice's space. But you can dump some unused apps to speed up iPhone. Perhaps the last thing you want is to find your iPhone or iPad battery drains out in the middle of iOS 12 update after a long period of downloading and installing. So it's urgent to charge your device to 100% to ensure a smooth iOS 12 upgrade without problems. See more tips about how to improve iPhone battery life >>. Salivating at the stunning iOS 12 features? Cannot wait to update to iOS 12 on iPhone iPad after your make a backup of iPhone iPad. In our complete iOS 12 update guide, here we introduce 2 simple methods to download iOS 12 and install it on the supported iPhone X/8/7/6S/SE/6/Plus/5s, iPad Pro/Air 2, iPod Touch 6. Note: you can also click here to go for more tips to solve the problem of iOS 12 download stuck or just uninstall iOS 12 if the operating system is less satisfactory. Step 1: Open iTunes > Plug in Device > Click on "Summary" > Hit "Check for Update"
Step 2: Click "Download and Update" > Agree terms & conditions > Enter the Passcode on iPhone iPad iPod. Step 1: Go to your device > tap "Settings" > "General" > "Software Update"
Step 2: Tap "Download and Install" > Enter Passcode > Agree terms & conditions > Tap "Install Now". 1. Force close the Camera App. 3. Reset all settings. Go to Settings > General > Reset > Reset All Settings. 1. Turn off background app refresh. 2. Turn off automaitc downloads. 3. Reduce transparency and motion effects. Go to Settings to enable "Offload Unused Apps" to auto delete apps. In Settings, turn on "Auto Delete Old Conversations". 1. Reboot your iPhone; Check Out App Updates. App Store - Updates - Update App. 1. Tap Settings > General > Usage > Manage Storage. 2. 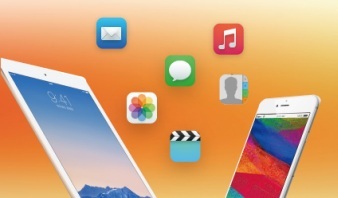 Delete apps you don't use or use Apple's help in deleting and restoring apps/games. 3. Transfer large-size files like videos, 4K pictures, HDR live photos, music to computer with a professional iPhone manager to free up space. 1. Turn off Feedback, Photos and other apps. 3. Remove the iPhone or iPad case, which may prevent the heat from radiating. 1. Reset network settings: Settings > General > Reset > Reset Network Settings. 2. Change DNS to Google's DNS: Settings > Wi-Fi > Network, enter 8.8.8.8 or alternatively 8.8.4.4 under DNS. 3. Turn off WiFi Assist and turn on it again. 4. Disable any Wi-Fi service on your iPhone iPad. 1. Turn off iMessage and FaceTime and restart them. 2. Make sure Date & Time is correct. Just go to Settings > General > Date & Time > Set Automatically to correct the Date & Time on your iPhone or iPad. 3. Sign out Apple ID and log in again. 4. Hard reset your iPhone. 1. Access to Settings to allow App Store to use Wi-Fi or cellular data. 2. Shut down your iOS 12 iPhone x/8/Plus/7s/7/6s/6/Plus/SE/5s and reboot it later. 3. Last but not least, update to iOS 12.X to fix this iOS 12 bug or downgrade iOS 12 beta to iOS 11. 1. Close App Store and relaunch it later. 2. Go to Settings to adjust Password Settings to Require Password in iTunes & App Store. Insert password before downloading apps. 4. Transfer apps from another iPhone to iOS 12 iPhone. The iOS 12 update won't end with iOS 12 software download and install on iPhone iPad. In fact, the follow-up process involves some important parts to ensure iPhone iPad run well on the new iOS 12 system, e.g. recovering data, jailbreaking iDevice, extending battery life, speeding up iOS devices, etc. In this sector, we've offer the best ways to improve the performance of iOS 12-powered iDevices, and help you deal with the iOS 12 post-upgrade problems and bugs. [Guide] Free download movies to iPhone X/8 (iOS 12) in full HD quality. iOS file manager helps to backup and manage content on iOS devices. Most early adopters are quite happy with the new features and improved performance after they update their iPhone iPad to iOS 12. However, not all users are satisfied. Clearly, being in its early stages, iOS 12 comes along with different bugs and stability and performance issues. Rather than being stuck with those iOS 12 bugs and waiting for the fix, not a few users updating to iOS 12 choose downgrading iOS 12 to iOS 11. If you have been suffering from iOS 12 problems you cannot fix, or dislike the performance of iOS 12 on your iPhone iPad, let's go back to iOS 11.4.1. 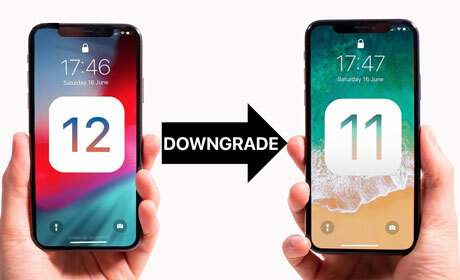 A guide to downgrade iPhone iPad to iOS 11 from iOS 12 is shared. Step 1: Backup your iPhone iPad. You can do this via iCloud or iTunes, or as per the iOS 12 backup guide shared in the above section. Step 2: Downgrade from iOS 12 to iOS 11.4.1. Find the .ipsw file for iOS 11.4.1 or earlier OS on your computer and open it. And iTunes will reinstall the previous iOS 11.4.1 on your device. Step 3: Recovery your data. 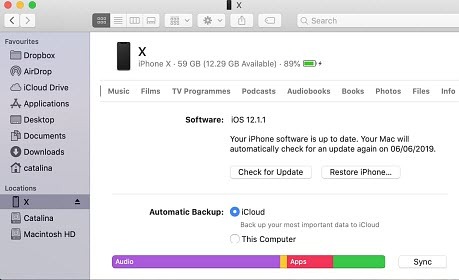 Now you can restore the iOS 12 backup data to the current iOS 11-based device from iCloud, iTunes or the backup method above. If you're still on the fence over iOS 12 beta update, take it easy as these important sites like macworld, cnet have offered in-depth write up on the iOS 12 new features, benefits and possible risks, and whether you should upgrade to iOS 12 beta or not. Below let's check what those sites say about iOS 12. The headlining feature of iOS 12 isn't something we can explain through screenshots. It's something you have to experience on your own. Instead of cramming countless new features into iOS 12 and adding to some of the already perplexing (and frustrating!) 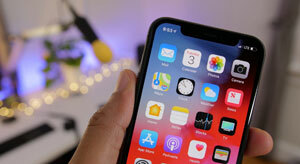 bugs we all experience, Apple is using iOS 12 to focus on improving the overall performance of its iOS device lineup across the board..
Last year’s iOS 11 update focused on adding a little more customization into the iPhone and iPad, along with a redesign of some parts of the operating system and key services like the App Store. Things are a little different with this year’s iOS 12 update, though. Yes, there are many new features that improve productivity on your iPhone, but there’s also a big effort to help people manage screen time, making it easier to stay offline. Here are two irksome features we hated about iOS 11 on the iPhone X that iOS 12 is going to fix. The final software is going to feel 200% less annoying when it launches. Closing app windows in iOS 12 is now easier thanks to the fact that all you have to do is slide up on an open app to dismiss it from the multitasking menu. And iOS 12 Photos app is no longer going to be filled with errant screenshots on the daily. Memoji, Animoji, and a bevvy of other gimmicks cement the importance of the Messages ecosystem. The Apple Books app has finally been refreshed, and Apple claims the new OS is so lickity-split fast that your keyboard will pop up 50 percent faster (my word!). But that is all icing. After making us spend a decade with candy-colored visuals and endless dopamine-squirt inducing notifications, Apple now intends to help us put down our phones. 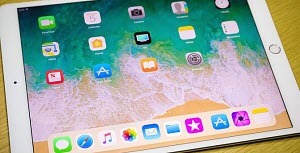 Though Apple focused on under-the-hood improvements for iOS 12, there is a long list of new features in the update that makes this an impressive new version of iOS, including Memoji, Animoji, and other fun effects can be used both in Messages and with FaceTime through the new Effects camera. In a later update, Apple also plans to add Group FaceTime with support for up to 32 people. MacX MediaTrans - Safe way to transfer iPhone iPad contents, such as videos, music and photos as a backup. Free you from any fear of insufficient space or data loss for iOS 11 update. 20K Free Copies before Sep 25, 2017. No Free Upgrade.